This second version of Hannah features a different and more expressive model. Though the identity of the sitter is unknown, she is likely to have been a North Wales resident, perhaps a neighbor or even the artist’s stepmother, Delia Dexter Trego. The same figure was used for the third version of this subject in 1901. While nearly identical in basic composition to the first version of the Hannah painting and containing several of the same details, such as the thread and the plant in the same exact positions, this version adds two details intended to refer to the Lucy Larcom poem that inspired it. 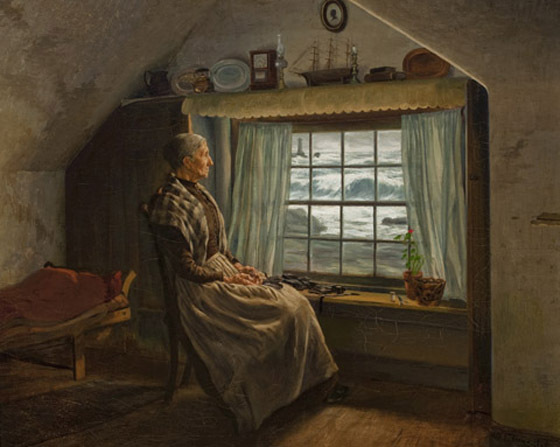 On a shelf above the window can be seen a clock and a model of a ship, clear references to the lost husband’s vessel and the passage of time. The gnarled hands and wrinkled face of Hannah have been carefully rendered, and the work she has temporarily abandoned seems to cascade out of her hands onto the work space on the windowsill. Upon close examination, the different portions of the shoes Hannah is assembling can be identified. The work was originally purchased from the artist by Luther Dowlin of North Wales. It has been passed down through the families of his descendants and is now in the custody of one of Dowlin’s great-grandsons. The painting had been mounted on a board and framed under glass decades ago and had suffered from that treatment. The canvas was wrinkled and there were other minor problems. After conservation and cleaning at the Pennsylvania Art Conservancy in 2010, the work is now in excellent condition.